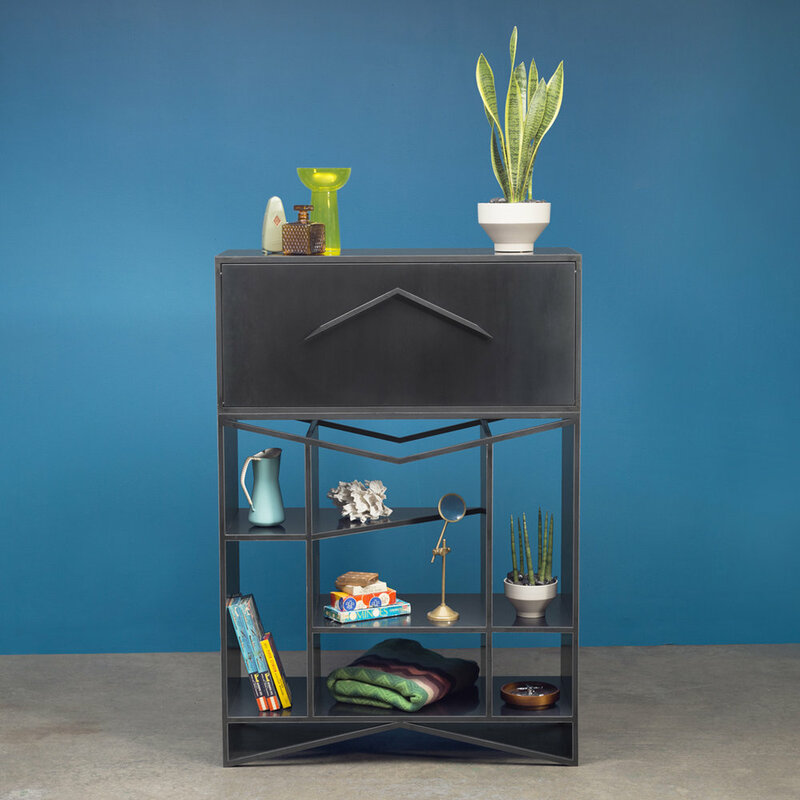 92.75 x 16.25 x 38"
By far the most versatile construction in Force/Collide's portfolio, the Meridian Modular Credenza is an all steel construction consisting of double-sided paneling and all-hidden fasteners. It provides total flexibility; the credenza breaks apart into three individual cabinetry components that can be reconfigured in numerous ways, or isolated and used independently. Hyper-dimensional in any arrangement, there is virtually no top or bottom to any one of the three components, lending them to function seamlessly in every 90 degree rotation. Spanning almost 8 feet across, and hitting 3 feet high, this is the perfect position for use as a traditional credenza, a centerpiece for a living room, a sideboard for the dining room, or a bookshelf for the library. Each of the three units bolt together from hidden access points inside the cabinet in order to lock together. Two square cabinets consist of open shelving that are mirrored symmetrically for maximized function aesthetic balance in either their horizontal or vertical positions. Divisions are carefully designed to be balanced no matter how the units correspond to one another; the variety of cavity sizes gives flexibility functionally and aesthetically, whether it be heirlooms, board games, books, liquor, glassware, or linens that are stored. The vertical position is another way to attain maximal storage with a smaller footprint. With the option to reverse the door and have it held open or to remove it altogether, this arrangement creates a dramatic effect and offers some extended clearances for objects that may be taller than usual. These clearances are a stand-in for what the top surface would provide when in the horizontal position. 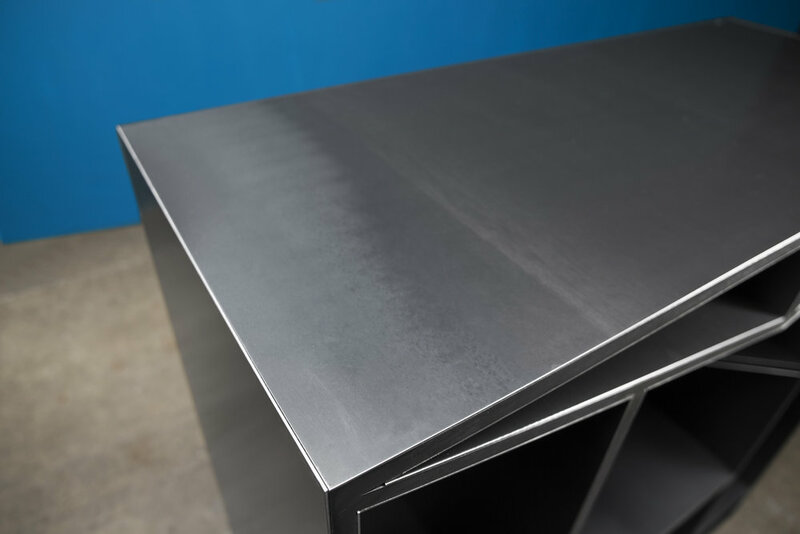 The surface quality of the hot rolled steel used to make the Meridian is scratch-free and luxe, the mill scale patterning carefully paired and emboldened by the process of oiling, buffing and waxing. 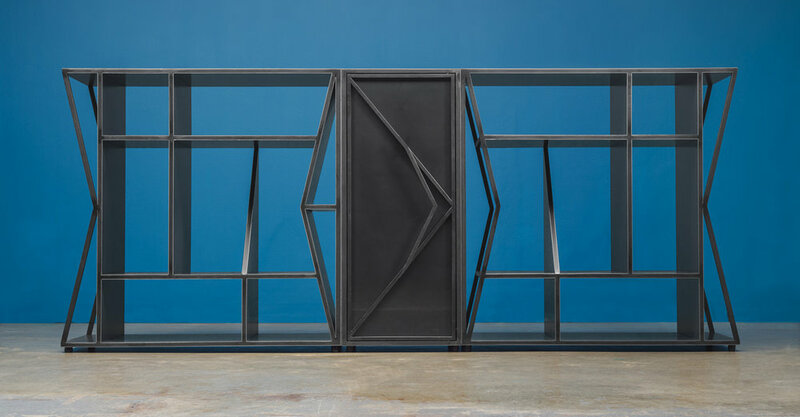 The framing is blackened to match, while the silver edges of the sheet metal form highlights that act as a geometric mapping of the mirroring cavities. 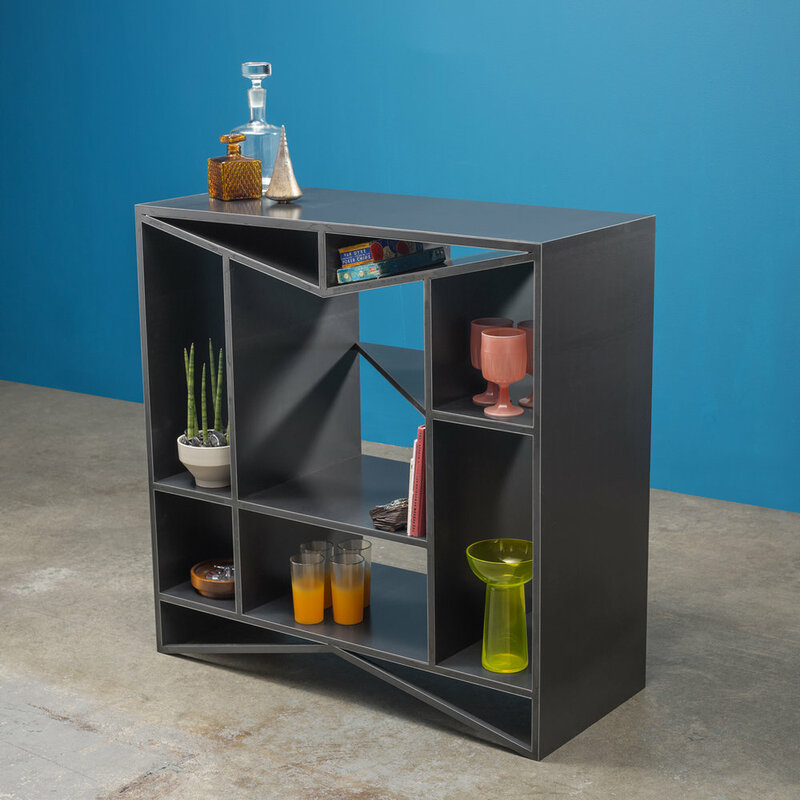 The corner position is the crux of flexibility for the Meridian Modular Credenza. Designed to give maximal storage in a minimal amount of space, one side of the right-hand unit has been left open to create an access point to the cabinet. The removable door being a key feature for this configuration, all shelves are fully accessible and surface counter area is equivalent to the horizontal configuration. The beauty of this design is that each of the three units is fully functional and complete in their stand-alone forms. Not only can they be broken down to independent pieces, but each piece is capable of rotating 90 degrees to accommodate alternative storage solutions. The cabinet comes with a removable, reversible door that accommodates every configuration with more than one option. Key design features making this possible: no hardware is visible, magnets are positioned to hold the door in place when closed, and chains can be added or removed from the frame to act as a stop when the door is open in the horizontal position. This gives three ways to use the cabinet: like a door (see horizontal position), like a writing desk (see below), or completely open (see corner position). Adjustable feet provide a guarantee that surfaces can be made level with one another in circumstances where floors may not be level or weight distribution becomes uneven, and finally, the units bolt together from the inside of the cabinet at hidden anchor points to lock it into its proper position and eliminate gaps once level.